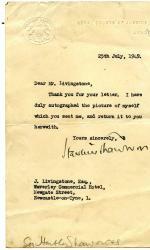 Autograph Note Signed ('Hartley Shawcross') to J. Livingstone of Newcastle-on-Tyne. 25 July 1949; on letterhead of the Royal Courts of Justice, London. 12mo, 1 p. On aged and creased paper. 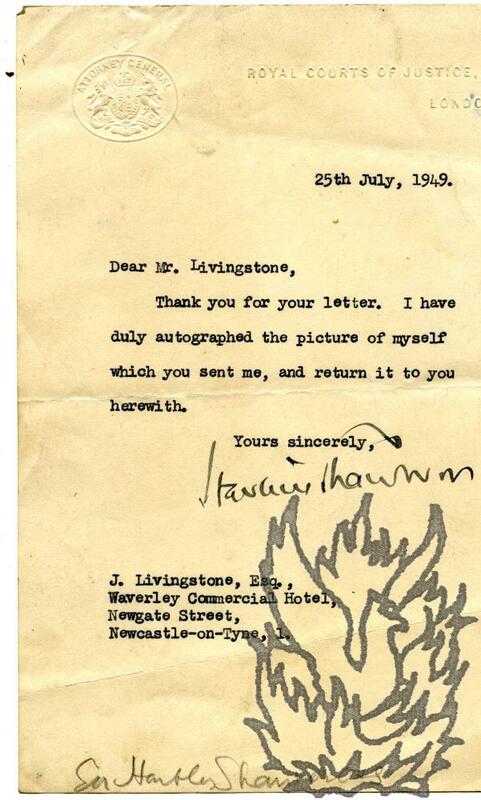 He has autographed the picture sent by Livingstone, and is returning it. The charter and judgment of the Nürnberg Tribunal history and analysis (Memorandum submitted to the Secretary-General). Lake Success, New York: 1949, United Nations - General Assembly International Law Commission. In printed wraps, vi + 99 pages. With ownership inscription of 'Sir E. Beckett' on front wrap. Wraps are worn and creased, with some loss not affecting text. Staple-bound with minor rust to staples. Text in good condition.